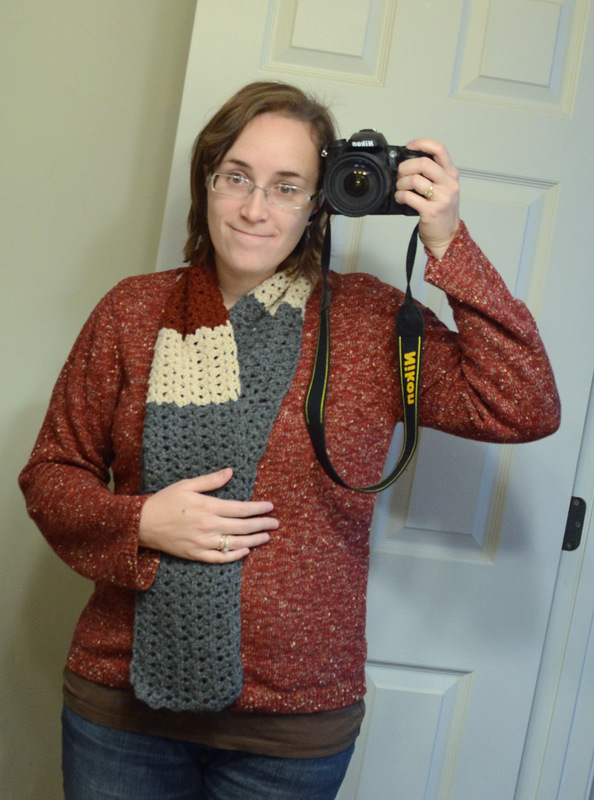 I actually completed this scarf about a month ago, but didn’t post pictures until it had made its way to the person who I made it for (sent it early so she could get more use out of the scarf this winter instead of waiting until late December). Didn’t want to spoil the surprise since she reads this blog! It was the very first thing I made after learning how to crochet. Here’s a link to the pattern. 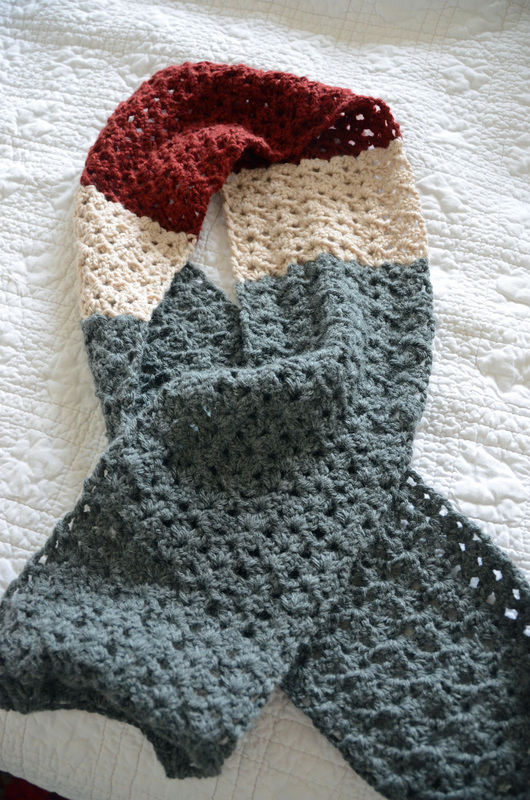 The only thing I did differently from the pattern is use three different colors in the scarf instead of one. I thought that made it a bit more interesting (the pattern is pretty enough for just one color, though!). If anyone is interested in where I find the patterns I use (I’m a tightwad, so I find free ones, but make sure to give credit where credit is due), please consider following my crochet board on Pinterest! I whipped this scarf up in no time at all. A very quick pattern! So far my handmade Christmas presents are coming along nicely! It’s much more fun than shopping. Have I ever mentioned how much I loathe shopping? Remember when I posted a little while back (where you can find a link to the pattern if you’re interested in making one of your own) about learning to crochet broomstick lace? Well, I finished the cowl I started for a friend. Didn’t it turn out nicely? I raided my button stash for the buttons, so they don’t match exactly but I think it’s better that they don’t. 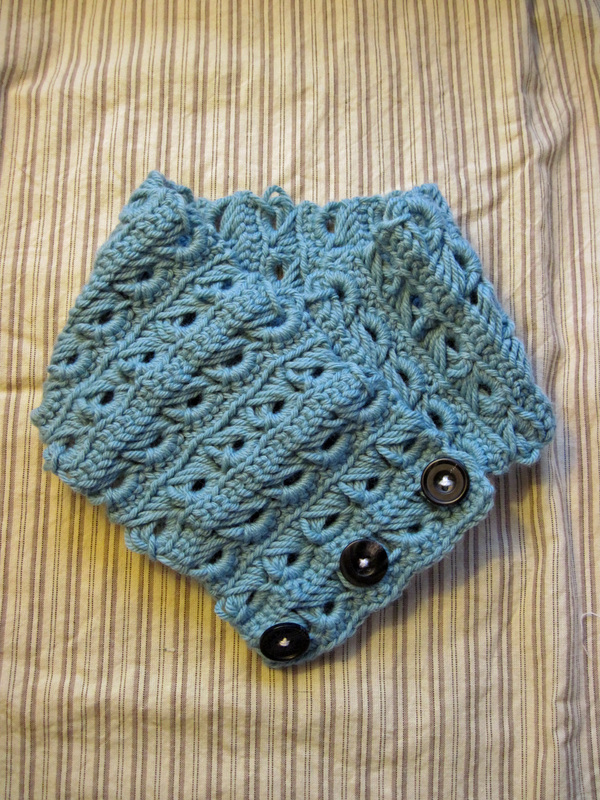 And I think this cowl might have really turned me on to them. They don’t slip around like scarves do! And when you live somewhere as cold in the winter as I do, it’s nice not to worry about exposed neck skin (Random tangent: I wear scarves religiously in the winter and when spring rolls around and I have to abandon scarves for the season, my neck is always chilly for a few days!). P.S. For anyone considering making something of broomstick lace, just be aware it takes longer than traditional crochet! For Jonathan’s first Halloween, I picked up a pumpkin shirt for him to wear as a costume. I wasn’t about to spend a lot of money on a baby costume for two reasons: one, cute as baby costumes are, they just feel like a waste of money to me, at least the first year; and two, Shawn and I didn’t have plans to be anywhere, so why spend money when we two were the only people who would see the Peanut’s costume? I did however have some cute photo ideas for his simple costume. And those ideas included carving a pumpkin with Jonathan. He preferred to watch the carving of our ‘Jack. We tried to get him to stick his hands in the pumpkin guts and feel the slimy, oozy-ness, but he wasn’t too into that. While we jointly carved the pumpkin, Shawn and I realized neither of us had carved a pumpkin since high school, perhaps even earlier than that. What a strange realization! 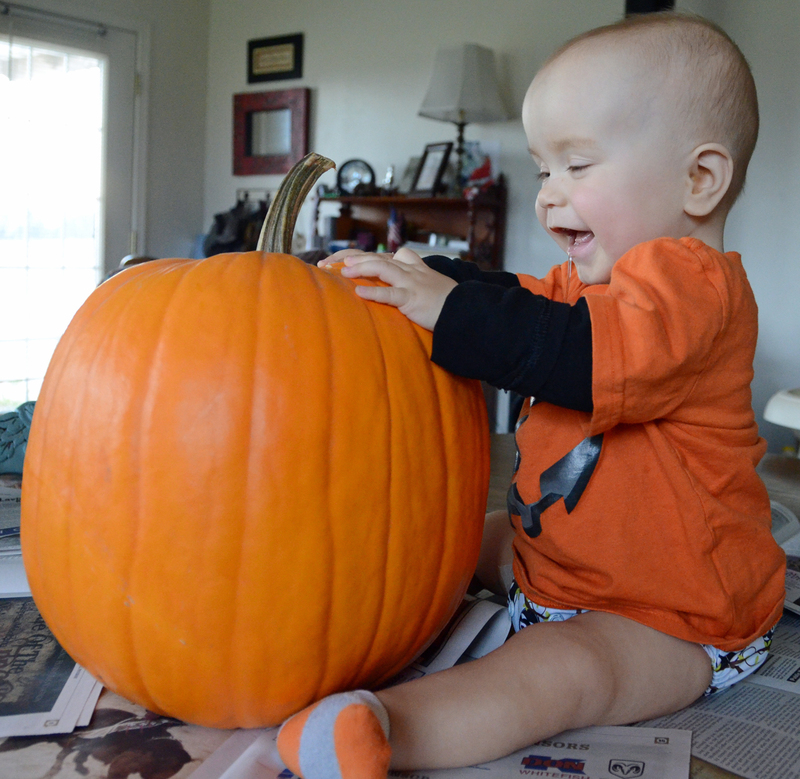 We do, of course, have a lot of pumpkin carving in our futures! 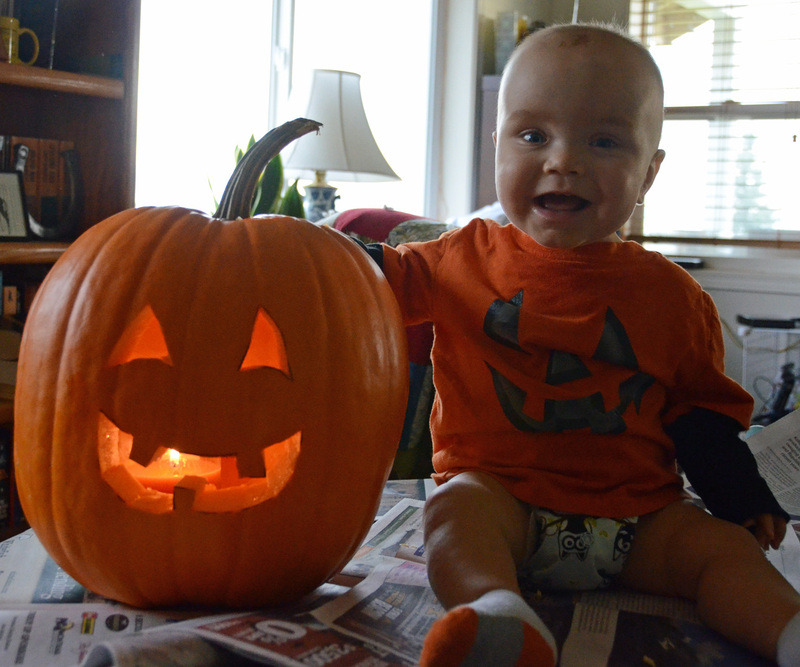 So without further ado, here’s some photos of our little pumpkin and his big orange friend.